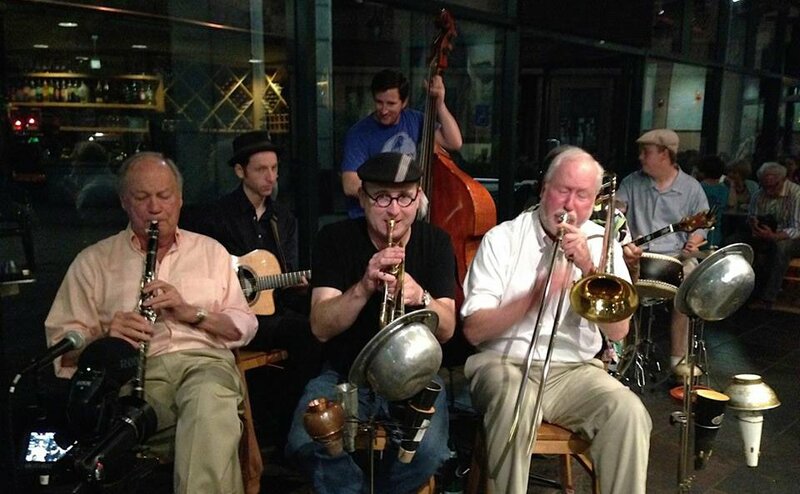 Come dance to Clint Baker’s New Orleans Jazz Band, and cheer on Harvest Moon Mix & Match finalists! Clint Baker’s NOJB was founded in 1990 and began playing at Cafe Borrone in Menlo Park in October 1990. Although continuing to play there as the Café Borrone All-Stars, the New Orleans Jazz Band became inactive in 2000 when the birth of Baker’s twins exacted extensive parenting duties from Clint. In 2006 the band regrouped due to many requests from the Bay Area swing dance community. Since then the band has been very active playing swing venues around the San Francisco Bay Area and northern California. This Lindy Hop competition is open to all amateur level competitors. If you are not sure whether you qualify, please ask. What is a Mix & Match contest? It’s a very friendly, supportive, and extremely fun event where dancers are randomly matched to their partners to show their social dance skills with their partner to a variety of music picked by the competition DJ. As such, it truly tests your skills as a social dancer. It will consist of 3 preliminary rounds and 1 final round. Preliminary rounds will be held on October 17th, 24th, and 31st. With the final round on November 7th to LIVE MUSIC! Participating dancers will be paired with 3-4 partners at random. The music style and tempo will vary for each partner. Each week, we will select 1st, 2nd, and 3rd place winners from our Leads and Follows. If you win a prelim round, you automatically qualify for the finals and will not be allowed to enter any other prelims. If you don’t win but place, you are encouraged to enter again. Earning a placement wins you points. In the end of the preliminary rounds, we will be adding up your total points over three weeks to determine any additional finalists and alternates for the finals. For this competition, Amateurs are defined as dancers who have not taught classes at a weekly event and who have not placed in the top three in any regional or national dance competition. Registration begins at 9:30pm and closes at 9:50pm Wednesday, October 17th, 24th, and 31st at Wednesday Night Hop. Spots are available on a first come, first served basis. To prevent time overruns for the contest, we will be limiting the number of participants each week. A limited number of spots will be reserved for in advance registration to help out dancers who have long distance commutes (say, Sacramento) and cannot make it in person for the 9:30pm sign-up time at Wednesday Night Hop’s discretion. Registration costs $3 for each preliminary round and is open to any eligible dancers who haven’t yet won a preliminary round. Remember that this is a friendly and fun event, so mark your calendars and we’ll see you there! Follows and Leads will be randomly paired and dance for 1 minute and 30 seconds to a different song picked by the competition DJ. There will be 3-4 rounds. Follows and Leads are judged separately in the preliminary contests. Judging for the preliminary rounds will be scored by relative placement. Each contestant will be assigned one partner, at random. Finals begin with a brief all skate warm-up, followed by a spotlight phrase battle to LIVE MUSIC. We go until the judges and crowd are satisfied! Judging for the final round will be scored by relative placement.